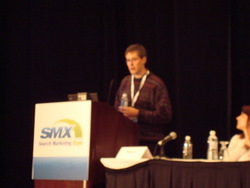 As mentioned in a previous post, universal search is a hot topic here at SMX West. My first session of the day: The Blended Search Revolution revealed insights from the major search engines about how they are â€˜compilingâ€™ the universal search results and how companies should take advantage of the opportunity. Universal search leverages new content such as news results, images and videos. The important item to remember is that this generation of search should not be scary for companies. If youâ€™re not quite ready to submit your videos to YouTube, start with a video site map, as mentioned above. The results may not come as quickly, but at least youâ€™re in the game. “Session: Googleâ€™s 5 Tips to Succeed in Universal Search” was originally published at Online Marketing Blog. if you get a moment, we’ve also composed some additional keys to improving universal search results across Google, Yahoo!, MSN and Ask. Though not complex, we’ve found it important to approach media optimization very systematically. There are cascading values to each media asset based on filename, media channel (for off-site media placement), social media interaction, keyword placement and density in titles, optimized tags, etc… (think classic SEO Best Practices) will produce more predictable results. It’s a great new place to play for the industry at large. Very interesting, do you have any more information on a video site map?